Please select either the 1-1/4", or 1-3/4" wood balusters below to see photos of Elegant Rise and Structural Rise balusters installed in a staircase. Then click either category to view products. Wood stair balusters are intended for interior staircases. We do however have one wood species that holds up to the elements quite well for many years for exterior stairs. That is African Mahogany. It is not the least expensive wood by any means, but it is beautiful and as mentioned, takes a beating in any weather conditions for many years. African Mahogany stair railing and balusters can be painted as well as clear coated, which is the the most common finish used to enjoy the rich beauty of the redish brown exotic color and grain pattern. 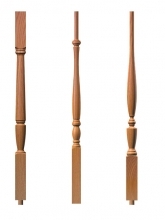 Custom and reproduction residential and commercial wood stair balusters are available in all hardwood species. Red oak, poplar, and hard maple wood stair balusters are in stock for quick ship. Some balusters are in stock in american cherry. White oak, brazilian cherry (jatoba), soft maple, african mahogany, santos mahogany, lyptus, walnut, hickory, ash, birch, white pine, yellow pine, alder, and antique heart pine, have a 2 week lead time to manufacture. Wood balusters are so much more than a point of detail, it is the pivotal descision that completes a carefully planned interior staircase design.